Young women by the Canellopoulos penthouse pool, Athens, July 1961. 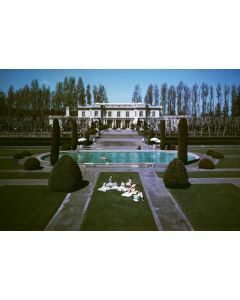 This C-Type Photograph can be purchased as an Open Edition or an Estate Stamped Limited Edition of 150. Produced through the Getty Images Gallery and dark room in London by experts who hand check and pack each print, the result is a beautiful, bespoke product. This print can be purchased loose, framed in standard black or white frame, or mounted in acrylic (ready to hang). Please select your size and framing option from the drop-down menus below. For additional framing options, images, and custom sizes, please email customerservice@wellappointedhouse.com. Please note this item is custom made to order and cannot be returned.